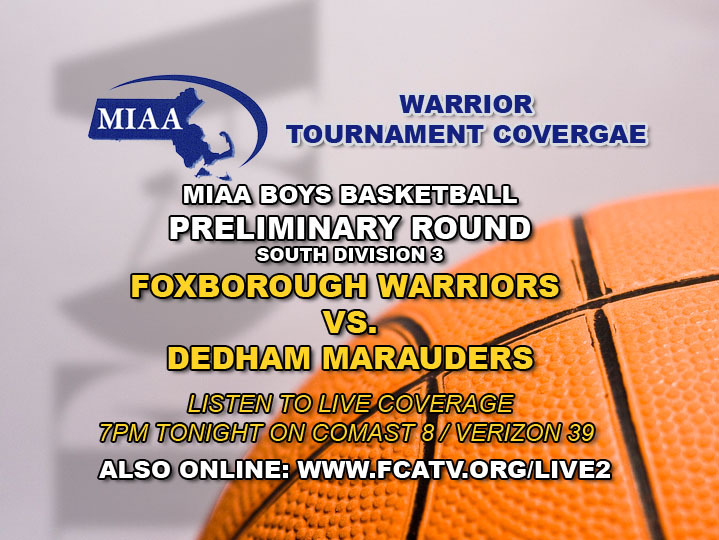 FOXBORO – Tonight the FoxboroÂ Warriors head to Dedham for the MIAA Division 2 Preliminary Round game scheduled for 7pm. 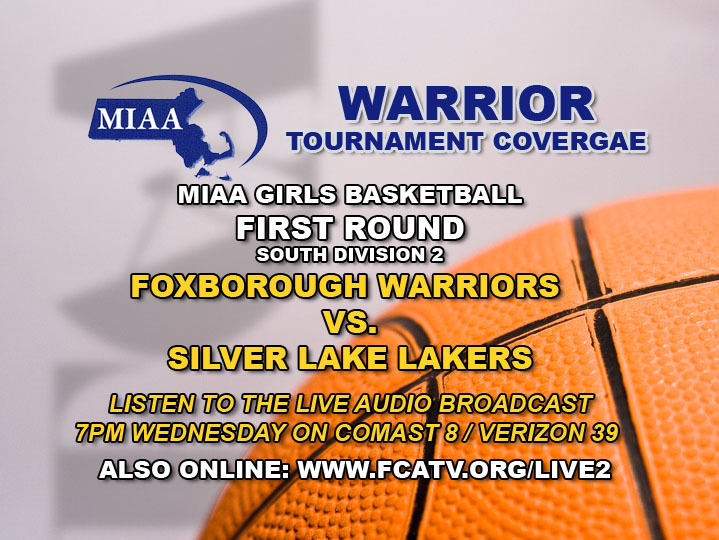 Foxboro Cable Access volunteers will be on-hand recording the game for broadcast later in the week,Â although live audio from the game is being planned for air on Comcast 8, Verizon 39, and streaming on this site. FCA would like to thank all the TV crew volunteers who have been so generous withÂ their timeÂ this season. Â If you would like to learn more about how to get involved, contact the studio at 543-4757 or email us info@fcatv.org. FOXBOROUGH, Mass. â€“ In what has become one of the most exciting, action-packed days on the annual New England football calendar, Gillette Stadium will again host six of the Massachusetts Interscholastic Athletic Association (MIAA) EMass Super Bowls in a single day. Twelve teams will compete for the Super Bowl title on Saturday, Dec. 4 on New Englandâ€™s most famous football field. They will be joined by thousands of cheering fans, cheerleaders, school bands and special guests. The Kraft family, which will donate the use of Gillette Stadium for the fourth straight year, will treat the Super Bowl participants and their fans to an NFL-caliber game presentation, with music and replays on the stadiumâ€™s high-definition video boards. Admission to the Gillette Stadium/MIAA Tournament experience is just $15 for adults and $12 for students/seniors. The fee includes all day parking, admission to all six games, and a game day discount of $3 at The Hall at Patriot Place presented by Raytheon. The Gillette Stadium/MIAA Tournament experience admission isÂ $15 for adults and $12 for students, children and seniors. They will be available at the Gillette Stadium Ticket Office, located outside the Patriot Place Gate, beginning at 8:00 a.m. on Saturday, Dec. 4. All fans will enter the stadium via the Patriot Place Gate, located near The Hall at Patriot Place and CBS Scene. Parking is included as part of the Gillette Stadium/MIAA Tournament experience.Â Fans arriving via Route 495 and Route 1 North should enter the stadium parking lots via the P7 or P8 entrances.Â Fans arriving via Route 95 and Route 1 South should enter the stadium parking lots via the P1 entrance.Â No tailgating will be allowed in the parking lots. Concessions will be available throughout the day at Gillette Stadium. In addition, Patriot Place features 16 casual to high-end restaurants for pregame meals or postgame celebrations. VisitÂ www.patriot-place.com for restaurant info. The award-winning Hall at Patriot Place will offer $3 off admission on Saturday with a ticket to the High School Super Bowls (regular admission to The Hall is $10 for adults, $7 for seniors and active military, $5 for children 5-12 and children 4 and younger are free). Coaches at Massachusetts Interscholastic Athletic Association (MIAA) member schools will be required to take a concussion education course offered by the National Federation of State High School Associations (NFHS) prior to the start of the Winter season. The MIAA Board of Directors voted recently to add this requirement to its existing wellness program for students, coaches and others involved in high school athletics. As part of the wellness program MIAA member school coaches are required to participate in an education course within one of year being hired. The course includes first aid instruction, recognizing the signs of head injuries and drug or steroid use among other wellness issues.Â In addition, member schools continue to require physical examinations for student/athletes and submission from a parent or guardian of a health history. The MIAA has long had a rule requiring a medical clearance before an athlete who has suffered a head injury can return to play. â€œMany of our schools go beyond the Associationâ€™s requirements and programs, working with physicians, trainers, school nurses, parents and outside consultants to expand awareness of safety issues in different sports,â€ Haley said. He reported that more than 4,700 Massachusetts people have taken the NFHS on-line concussion program voluntarily this Fall. Visit the MIAA website (www.miaa.net) for a comprehensive concussion resource menu, developed by the Associationâ€™s Sports Medicine Committee. The MIAA Wellness Program is currently celebrating its 25th anniversary of promoting the health and safety of the student-athlete. The program consists of extensive programming and policies focusing on helping students make healthy life choices. This month the MIAA held its 14th Annual Wellness Summit at which hundreds of students, coaches and administrators participated in the daylong conference.